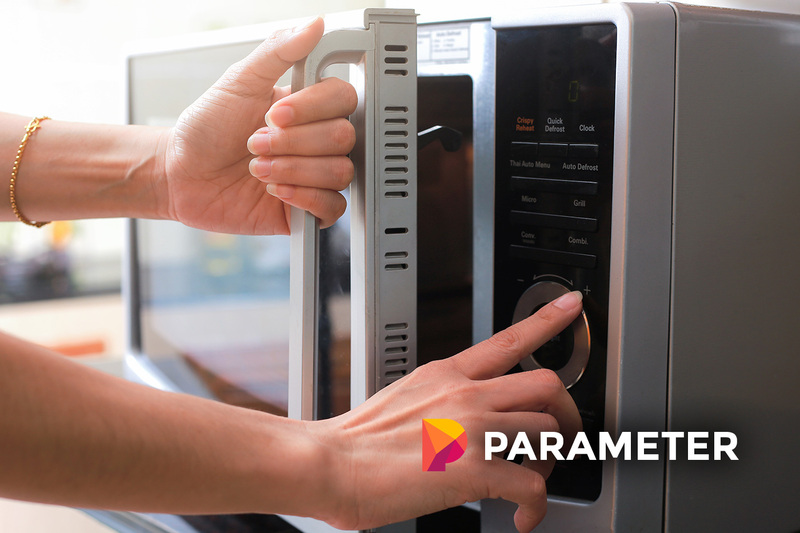 When most people ask about microwaves, they are asking about the appliance that sits in almost every kitchen out there. But microwaves can also refer to micro-waves, which are the very small waves that are used to heat food within your microwave oven. But the technology behind the microwave oven is really confusing. We know from science class that if we were to be exposed to the radiation inside a microwave oven that it could have serious consequences. But somehow, the microwave cooks our foods safely without ever affecting us and without heating the containers that we nuke our food in. They remain cool while food heats up. These are all mysteries that can be answered by the science of microwaves, but they do take some explaining. 2 But what about the Micro-wave itself? Microwave ovens do not have to heat up like conventional ovens, and they heat food in a very different way. That’s why they are able to heat up food much faster than the standard oven that you would find in your kitchen. Even a toaster oven has nothing on the microwave when it comes to cooking speed. With a conventional oven, food heats very slowly because the heating elements outside of the food cook the exterior of the food first and then move on towards the inside. That’s why you have to look at the center of a pot roast or other food item to find out if it is fully cooked. Microwaves cook food much differently. They cook food evenly by passing through the food while it rotates on a glass plate. A microwave can cook an equivalent piece of meat around six times faster than your conventional oven can. In addition, they use less energy than a conventional oven. The microwave is an enclosed metal box that does not allow any of the waves to escape, and has numerous failsafes to make sure that humans can use it safely. 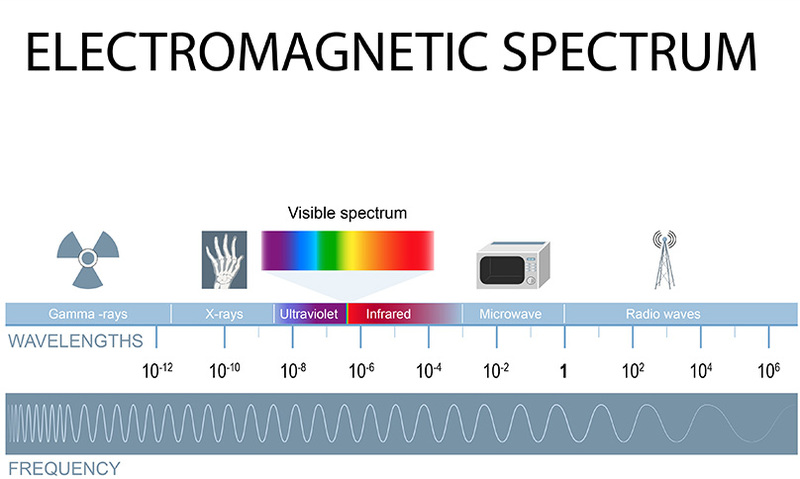 Magnetic waves are generated from a device inside the microwave oven called the magnetron. You can see the magnetron if you look inside your microwave at the grid that is usually on the right-hand side. But what about the Micro-wave itself? A microwave is the shortest radio wave out there. These microwaves work in very much the same way we know other waves work – just like radio waves for example. These waves move through the air at the speed of light which is 186,000 miles per second and while radio waves can be extremely long in between each wave, a microwave is only about 5 inches between one wave crest and another. There are many different kind of waves out there, and you can do some more research on the entire spectrum if you choose. You may also be wondering why it is that microwaves cook the food inside of plastic and glass bowls but they do not heat up the plastic bowls and melt them or crack the glass when these containers are used to heat up your dinner. The reason for that is fairly simple. Scientist discovered that while microwaves affect living tissue and can cause severe damage and heat at high levels, those same waves pass right through plastic and glass with no interaction at all. That means that those items do not heat up from the microwaves themselves, but they can get hot from the food touching them that is being heated up by the microwave oven. While microwave ovens are inherently dangerous to humans, they are also designed to be extremely safe. The reason that they are dangerous is that they carry a huge amount of energy. If you can put a piece of raw meat into a microwave oven and have it cook completely through within minutes, you can imagine what it would do to human tissue. But the units are designed to capture all of the microwaves that are bouncing around inside and not let them escape. When the microwave is turned on, there are microwaves inside, but the moment it is shut off again they dissipate. Even if something were to happen to the microwave, like a tiny hole that would allow waves to escape, the microwave would not function. Microwave ovens have lots of failsafes to prevent this from happening. Even so, if your microwave is old or has sustained damage, it is a good idea to replace it. You should probably replace your microwave every 2 to 3 years just in case anyway. That way you always have the latest microwave oven with the most up-to-date safety technology. The brief sketch that we just went over may work for most people that are looking for an explanation on how microwave ovens work and how microwaves themselves work, but for those that are craving a more in-depth explanation, let’s get into more detail here. You know that the microwave unit is a metal box surrounding a cooking pit with a glass dish that is set up to rotate. Inside this cooking unit is a lamp that illuminates the food inside as well as a magnetron. 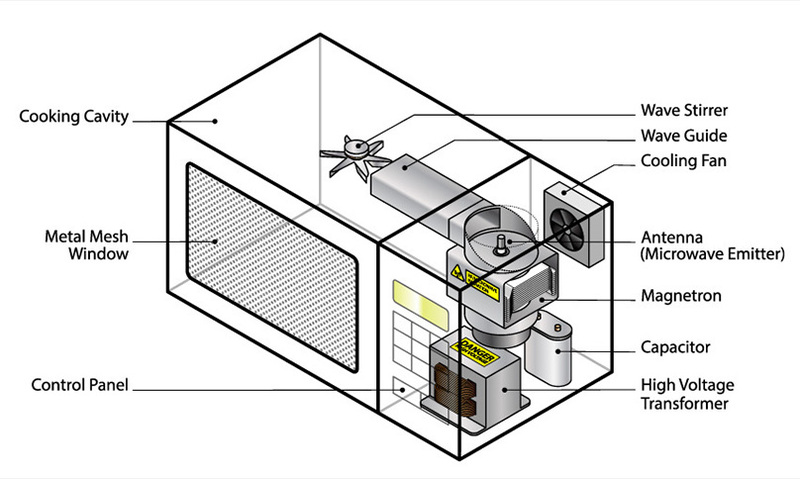 It is this magnetron that generates the microwaves that cook your food. You can put lots of different things in the microwave that can be cooked including meat, vegetables, water, pasta and more. You can put that food inside of plastic or glass containers and it will heat up the food without heating up the container itself. Sometimes a plastic does not stand up well to microwaving for too long, and some materials such as Styrofoam do not work that well in a microwave at all. You also always want to avoid putting other metals into my great because they will spark and start a fire and destroy your microwave oven. The magnetron is set up inside your microwave to blast waves into your food on one side the rotating plate keeps the food moving around so that it gets evenly cooked. If for some reason your rotator plate is not working, then when you take the food out of the microwave you’re probably going to notice that it is not fully cooked. The wall of a microwave oven is made of a reflective metal that bounce the microwaves back and forth just like light bounces off of a mirror. However, when they reach plastic or glass, they pass right through that material and penetrate the food to your cooking. These waves vibrate the molecules inside of your food more quickly and the more these waves vibrate the hotter your food gets. This is a completely different approach from the way that conventional ovens cook food. When you put food into your oven, the oven heats up and begins to cook your food from the outside and then permeating on the inside. That’s why you often have food that is cooked on the outside and not cooked on the inside. While some people think that micros cook food exactly the opposite – from the inside out – that is not entirely true. Microwave ovens cook food evenly by passing the waves through one area of the container while it rotates to cook food evenly. However, sometimes this holds true. For example, if you are heating up a chicken pot pie, the inside is much more liquid than the outside, and liquid will heat up faster than the crust. If you’ve ever put water in the microwave and left it there for several minutes, you might’ve noticed that much of the water had disappeared. That’s because when microwaves excite the water molecules or the molecules in food, it drains part of it which is why some food comes out dry when cooking them in a microwave. It is also important to note that these waves do not have the ability to penetrate more than an inch or so, so food has to be cooked in an oven if it is too big for the microwave. Microwaves have been around for a long time and they have made our kitchens a much more pleasant place to prepare food since the late 1970s. However, the properties of the microwave were discovered by electrical engineer Percy Spencer. He was doing experiments with radar and radio waves as early as the 1940’s, but got a patent for the microwave oven and now it is the main way to heat up food in a hurry. The bottom line is that while can be relatively complex to understand the principles behind the microwave oven; the operation of the microwave oven is extremely simple. You just put food in in an approved container, choose how many minutes you want to food to cook and close the door and press start. You can have a TV dinner in two or three minutes or a cup of coffee in less time than that. It is an amazing invention that is one of the most important of the 20th century.